Identical twins, Baby Link and Baby Logan, were born 18 days apart in Washington. Initially, doctors at EvergreenHealth Medical Center expected both twins to be born at the same time; however, things went differently. 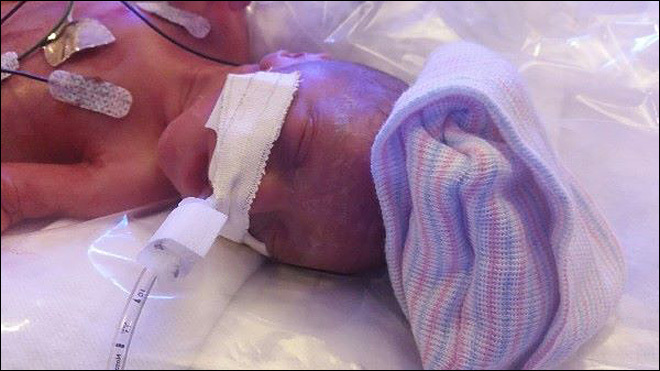 On September 29, 2015, Baby Link was born 23 weeks into his mother’s pregnancy. Link weighed just 1 lb, 2 oz. at birth and has heart and lung issues, but is doing well for his condition. His brother, Logan, remained in their mother’s womb for two and a half more weeks and was born on October 17, 2015. Baby Link and Baby Logan’s unique days of birth was caused by a complication known as Twin to Twin Transfusion Syndrome in which the babies shared a placenta. Dr. Martin Walker, who delivered the twins, explained the condition. Dr. Walker performed surgery, in utero, separating the babies’ blood vessels. This helped save both of their lives because it solved the issue of blood flow and made it possible for Baby Logan, who was anemic and weak because of the loss of blood, to stay in the womb longer. Doctors had hoped that Baby Logan would stay in the womb until his due date of January 26, 2016, but like his brother, Link, he was delivered earlier. The twins’ father reports that both Link and Logan are doing well considering their medical circumstances.